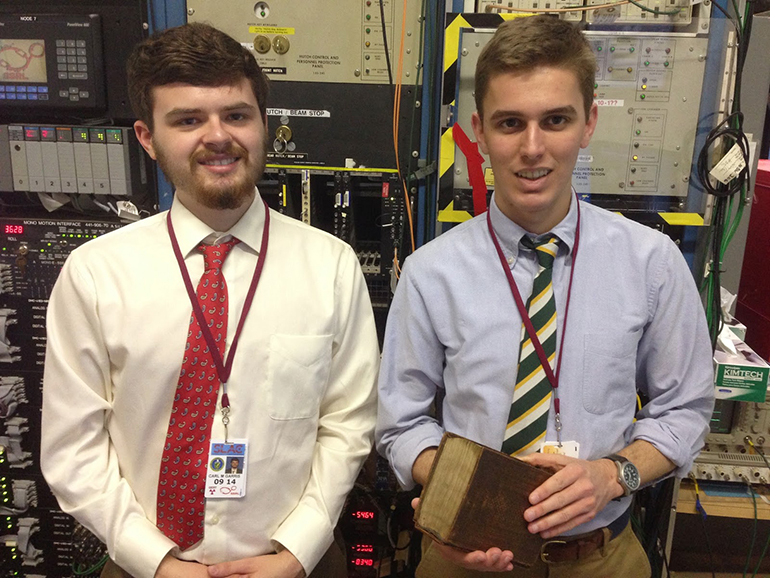 Data collected from beam-line time at a Stanford University synchrotron is helping a research team uncover the origins of one of the University of South Carolina's most valuable artifacts. A case of medieval identity theft might have allowed an unusually rare Pocket Bible from the 13th century to find a home at the University of South Carolina. If researchers can establish that the hand-lettered book was once part of the holdings of a pre-Reformation English monastery or friary, they'll bring to light a truth hidden nearly 500 years ago. The center of attention is a Bible auctioned at Christie's of London in 2010. Handwritten in Latin by a medieval English scribe around 1240 A.D., the Pocket Bible comprises more than a thousand pages of parchment yet is quite compact for a book of that era. That provenance alone makes the manuscript a valuable collectible. Purchased for $77,000 with support from the B.H. Breslauer Foundation, it now has a permanent home among other medieval books and artifacts in the Irvin Department of Rare Books and Special Collections of Carolina's Ernest F. Hollings Special Collections Library. But there may be even more to the Breslauer Bible than that: It could be a very rare survivor of Henry VIII's suppression of the English monasteries in the 16th century. "If this book had ever been proven to have come from an English monastery before the Reformation, it would never have been granted an export license," says Scott Gwara, an English professor in the College of Arts and Sciences and leader of the research team. "They would never have let it leave the country – it would have been deemed a national treasure." Owing in part to the pope's refusal to grant him an annulment from his first wife, Henry VIII set out to remove papal authority from the church in England and replace it with his own. One of his earliest actions in starting the English Reformation, and a particularly lucrative one for the crown, was to close the religious houses loosely called monasteries, which included various abbeys, priories, nunneries and friaries. From 1536 to 1540, they were systematically shut down, their land and other property was appropriated by the government or sold, and many of their leaders and adherents were chased away, pensioned off or even executed. "The result of this was a large-scale dispersal of medieval manuscripts that were housed in all of those monasteries, thousands of them," says Gwara. "These manuscripts just went everywhere. Many of them were destroyed." "I read in some sources where one was used as toilet paper," says Carl Garris, a Carolina freshman and history major on the research team. "A more common use was that they'd use them in the binding of other books." As a result of this dispersal, pre-Reformation manuscripts that once belonged to religious houses like monasteries are exceptionally rare, but no one thought the Breslauer Bible was in that category until a visiting scholar from Cambridge University, Christopher de Hamel, noticed an almost-invisible inscription. Written in cursive, it appears on the first folio, where the owner of a book will typically inscribe his or her name to indicate ownership. "The script is obviously either late 13th- or early 14th-century English," says Gwara. "It gives a name in Latin, 'by gift of brother Richard.' "
The owner being a "brother" lends credence to the notion that the Bible once belonged to a friary, but most of the rest of the inscription was unreadable or had been removed. Thanks to modern scientific instruments, however, that's not the end of the story. "The thing about medieval manuscripts is that they're made of animal skin – parchment – and when you write, the ink seeps into the skin," says Aaron Sanders, a junior and the third member of the research team. "You can erase it by taking a knife and scraping it across the surface. It scrapes the ink off the top, but because it's parchment, some ink is still left inside the porous membrane." Iron is a component of the gall ink used by medieval writers of that era, and Gwara and his team thought the SLAC National Accelerator Laboratory operated by Stanford University could shed some light on the subject. X-ray beams at the synchrotron there have been used to illuminate the underlying iron in text that remains unseen on parchment under visible light. The team applied for and earned both a Magellan Scholar grant from Carolina as well as "beam time" at SLAC, traveling to Stanford in March. A surprise was that iron wasn't, in fact, the best metal for visualizing text on the vellum. 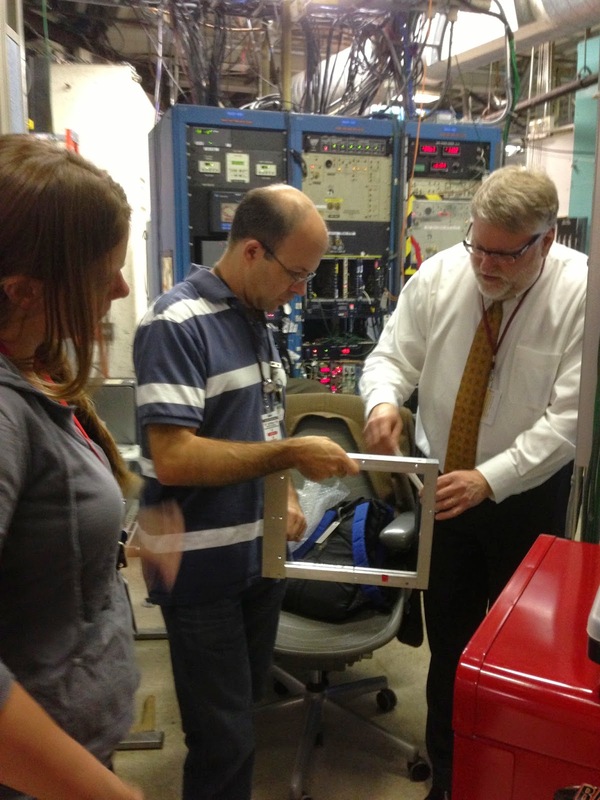 The facility at Stanford is able to map a variety of elements on parchment, and the team looked at several. "In addition to iron, we discovered quite a bit of zinc as well," Sanders says. "That ended up being the best – our element reading with zinc lit up like a Christmas tree." The visualization made new words legible, including what are apparently place names from medieval times and what appears to be the word "Minores." That is likely a Latin reference to the Franciscan friars, who referred to themselves as the Friars Minor. "We can now read the full inscription," Garris says. "We can see the names of the recipient Brother Adam and the donor Brother Richard. We're now identifying the institution that used the book. We think it was a medieval hospital near Oxford." "We are now pretty sure that it belonged to Franciscan friars who were in England," Garris says. "We're trying to decipher those place names and see if we can track down records of those friars, because if we can match it to certain friars, or even a friary, that would make it more certain." 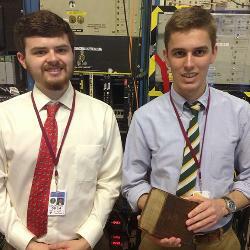 Their research project will continue over the summer, and the team hopes to publish a paper once they have their final findings. And they're pleased to be working to solve a mystery no one even knew existed for nearly half a millennium. "It really brings home the power of technology. This guy, whoever he was, thought he could erase this inscription and stop anybody from ever knowing who this object had belonged to," Garris says. "But we foiled him. With modern technology, we could read it, just like the day it was written." Aaron Sanders and Carl Garris have a blog detailing their research project with professor Scott Gwara. Visit Carolina's Promise to learn how you can support similar projects.